Two starkly different social mood trends are now unfolding around the world: North America enjoys a mostly positive mood, even as negative mood dominates the Middle East, North and South Korea, Russia and much of Europe. 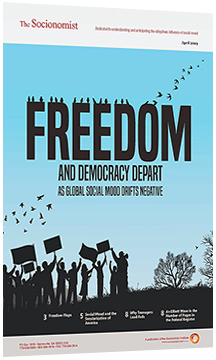 In this timely article, socionomist Chuck Thompson outlines twelve notable social expressions of these contrasting mood trends. You can read about several of them below. Negative mood is spilling over national boundaries, bringing war, terrorism and an influx of refugees to neighboring countries and beyond. A November 10 Vice News headline reads: “Saudi Arabia’s New King Likes Beheading People Even More Than His Predecessor.” King Salman took over leadership of the nation in January, and under his watch, Saudi Arabia has executed at least 151 people—far more than in recent years, when the number of executions rarely exceeded 90. Saudi Arabia’s negative mood is reflected in its Tadawul All Share Index, which has been in a bear market since 2006. Europe is becoming a hotbed of scandals, where the Euro Stoxx 50 is down 36% from its 2000 all-time high. Last month’s issue detailed a scandal involving the suspensions of top officials of FIFA, the International Federation of Association Football. This month, the Vatican is the focus of scandal after the release of books by two Italian journalists. Revelations in the books are based on stolen documents, and two members of a financial reform commission appointed by Pope Francis in 2013 have been arrested as part of an investigation into the theft. Merchants in the Temple alleges that the Vatican is a “black hole” where millions of euros disappear as a result of waste and mismanagement. Another book, Avarice, alleges that €378,000 that churches gave in 2013 to help the poor went into a secret account for Vatican expenses instead. November also brought the release of the film Spotlight, about Boston Globe journalists who uncovered sexual abuse of children by priests in Massachusetts and an attempted cover-up by the Boston Archdiocese. In a November 8 speech in St. Peter’s Square, Pope Francis said he plans to continue his effort to financially reform the Vatican bureaucracy. Today, the continuing strength of the long-term positive mood trend is contributing to the stellar success of The Martian, which has earned $215 million at the US box office. Continue reading this 5-page article to discover how these two very different mood trends are driving other social events across the globe — including chemical weapons use in the Middle East, the refugee crisis in Europe and pot legalization in the United States.